A team led by two Vietnamese researchers at the National University of Singapore (NUS), Assoc. 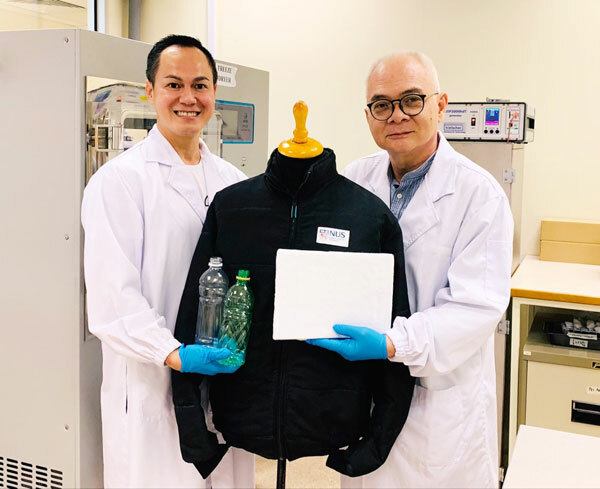 Prof Duong Minh Hai and Prof Phan Thien Nhan, have found a way to breathe new life into discarded plastic bottles – turning them into one of the world’s lightest material called ‘aerogel’ that has a wide range of applications, including heat insulation, sound insulation, and absorption of oil and other pollutants. “I wanted to come up with a real product for everyone, after a lifetime of producing theories,” Hai said. Aside from the shorter fabrication time and use of less expensive equipment, the PET aerogel also claims superiority over its predecessors because it doesn’t involve toxic solvents that could irritate the skin or eyes, Professor Nhan said. “When I came to Singapore, when I was attempting to dispose of some scraps but couldn’t find a recycle bin so the cleaners asked me why I didn’t just find another use for them instead of throwing them away, so I took that as a challenge,” Hai told Việt Nam News about the origin of his endeavours that spawned the trilogy of “eco-aerogel” from fabric, rubber, and the latest ’waste’, PET plastic. However, Hai observed that the recycling process only produces low-value products so people are not really interested in collecting or recycling them in the first place. “Based on our experiments, regarding heat insulation, PET aerogel is seven times better. Its soundproofing capacity is 30 per cent higher than the most used material called Basmel,” Nhan said. The material could endure heat of 620 degrees Celsius – seven times higher than conventional thermal lining materials but ten times lighter, making it extremely useful in case of fires at high-rise buildings, Nhan said, giving people a longer window to escape with less burn injuries and lower risks of smoke inhalation. Hai and Nhan also suggested that the aerogel could potentially be used to line the walls of Vietnam’s cars, future North-South expressway trains, urban metro and future bullet trains as its ability to absorb heat and sounds could reduce the power demands for cooling and cut back on noise reaching passengers. “One gram of solid PET aerogel could absorb up to 100g of oil, or 90-100 times their weight. 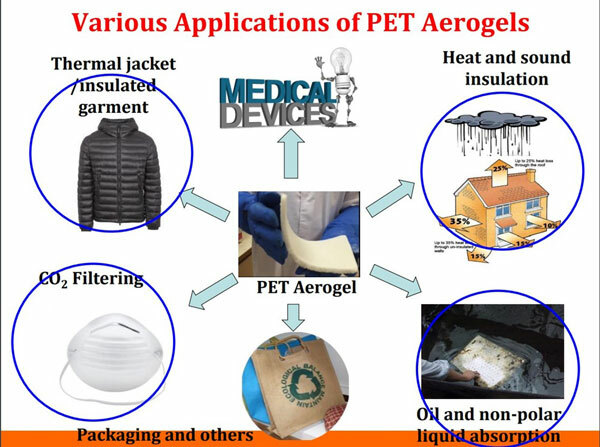 PET aerogel reaches its maximum capacity in under one minute while the polypropylene products take up to five minutes,” Hai said. “We aim for the long-life and high value engineering applications, not for the single use and low-value applications like plastic straws. For some applications such as heat and sound insulation in buildings, aerogels can last more than 20 years without breaking their structures and releasing dust particles into the buildings,” Hai said. Prof Nhan stressed that the recycling method matters and the team is mindful of the need to not cause more burden on the environment and strive for a green fabrication method that involves mostly water, and very little at that – 1cu.m. of water for 100sq.m of aerogel. “Singapore’s National Environment Agency under the Ministry of Environment and Water Resources has facilitated the meetings between us and local companies,” Hai said, adding that Indonesian companies have also proferred to set up joint ventures. 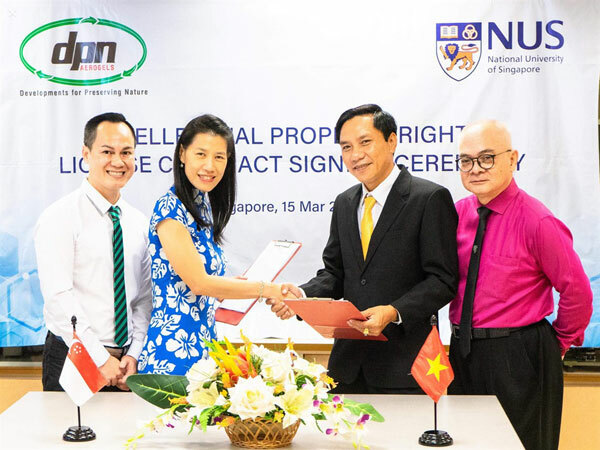 In the case of Vietnam, the HCM City-based DPN Aerogel JSC last week received exclusive IP rights from NUS to produce eco-aerogels from fabric waste, rubber and plastic. DPN expects to produce 100,000sq.m of aerogel per year for the first production phase and launch its commercial products in 2020, with Hai and Nhan serving as the company’s technology consultants. DPN Aerogels JSC aims to have the “100 per cent made-in-Vietnam high technologies” and can “re-sell” their aerogel technologies to foreign companies. Nguyen Vo Tuan Huy, CEO of DPN Aerogel, said that Nhan and Hai care deeply about the development of Vietnam and hope that Vietnam is one of the first places to deploy their technologies, to help address the pressing environmental concerns arising during the country’s fast growth and enhance daily life quality of Vietnamese people. 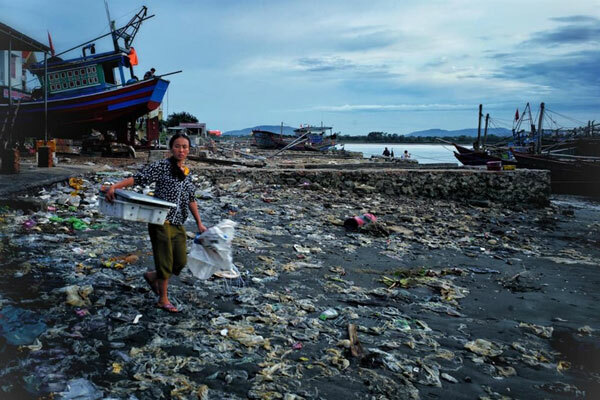 He referred to Vietnam’s position as one of the top offenders in discharging plastic into the ocean and wished that the aerogel products could help alleviate the situation and furthermore, engender a new awareness among the public regarding recycling and the use of plastic as a whole. As the Government deems it necessary to expand this type of fossil-based electricity to feed the increasing power demands of the economy, a move widely condemned by environmentalists and the public, Huy said their aerogel solution would use this very source of pollutants to fight off pollution, via a range of eco-friendly, high-value carbon-based products to filtre water and air.